A simple and convenient solution, this Choice 2 1/2" chrome menu / card holder is perfect for showcasing your name cards, table numbers, food items, menu specials, and reserved signs! This holder allows you to attractively display information right on your tabletop or buffet line. Your customers will appreciate the convenient information available to them as they can pick and choose from your best options to make the most of their dining experience. We use these menu cards to display the name of the food we are catering and also to advertise our business. These card holders can hold business cards or any type of small signage. Great card holder. Love the shiny coating. It adds an elegant feel to our table. If you use large card size these may not work for you. However smaller size is perfect. Such a great find. With a large family, having an easy way to leave a message or instructions is really important! These economical menu holders work perfectly for that. I can leave a message on the table or counter that my kids will see when they get up! Another great product! I like these card holders. They can display menus as well. They look great on the table or counter where guests or customers can see! Many restaurants like to display menus and signs at the table. 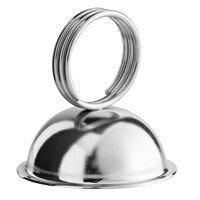 This metal ring menu holder can be used for table numbers, drink special advertisements, as well as marking a table reserved. If this item becomes dirty we do recommend handwashing to keep it in the best shape. Love these I used them In imy bakery case with the mini chalk boards and mini chalk markers. Very classy and cleans up well, highly recommended. The two and a half inch metall ring-type menu and card holder is exactly what I had hoped. It is the perfect size and design to hold name cards, reserved signs as well as daily special lists. The low profile, sleek look and stainless steel color offer a delicacy to any table. These card holders worked perfect for our needs. I planned a 1950s themed sock hop for my aunts birthday. We actually served food diner style and had a couple of rollerskating waitresses. We used these as table markers and put a picture of a 1950s Icon to help when dividing up tables and delivering orders. Super cute and very durable. This is functional, and looks nice. I use this to hold recipe cards up while I cook to avoid getting them dirty. The slot you slip the card in to is secure, and I have not had anything fall out. I prefer these menu/card holders over others I have bought. They are little more but they are more durable then others and have a nice professional look and design! These have a nice heavy base, and they sit well even on uneven products. The ring is annoying large, and blocks a significant part of whatever card you stick in it. These are larger than I imagined them to be, but they work well for signage on our tables. I use them mainly for a "samples" sign and a "reserved" sign. The quality of the 2 1/2" Metal Ring-Type Menu / Card Holder exceeded my expectations. The price is also very reasonable. I would definitely recommend! These are perfect for the dinner parties that I have. It makes sitting a large group of people, very simple. PERFECT. And, since I can use over and over again. ...it's worth my money. I placed this on our display case with a specials sign loaded in it so it's right in the customers line of site. Really simple item to use. I use this mostly to hold up pages from my recipe book whenever I'm cooking. The base ensures nothing falls over. I can't say I have any complaints. I really like this metal ring! You can use it for business card photos reservations and so on. It's light in weight as well! We use these card holders to hold labels for our pastries inside of a cold case. The shiny chrome look is clean and eye catching. Purchase these table number holders from Webstaraunt. I had been looking all over for these holders. Very small and convenient, wont take up much space. Best product for the price. We use them as a gift to our customers and they add out product photo to it, a win win. We use these for our display cases to label each product. They are great quality and do not rust when washed! They don't take away from our displays since they are small, but the perfect size!! We use these to hold table numbers for banquets. They are affordable and very well made. They are perfect to hold smaller pieces of paper. These are great for labeling product. They are bigger and sturdier than I thought they would be. Appear very nice and are very versatile. Will be buying more of these! This card holder was perfect. I am going to use it for a classic birthday party. It is very steady on the table and hold up card perfectly. These are amazing. They work very well with the mini chalk cards and marker display. I ordered both and used them together. All my guests loved them. These little menu holders are great! I use them in my pastry case and they work perfectly! They are solid and do not tip over easily! Would order these again. I purchased these for a party to hold up table numbers. They are sturdy and well made....was unsure of this when I first ordered as the price was so good. Perfect lil table ad holders, works for us in out catering business, at this price you may aswell order a ton cause you'll need em. These adorable little card holders look great on a buffet table or in the store to hold price cards. Shiny sliver finish looks great with any decor from classy to country. These are wonderful business card holders and we also use it for order slips. It makes it easy to keep it in one convenient location and a holder that holds it tight enough. These are a great value and they add just the right touch of class to your event. We use them for holding event cards on our dining tables or for buffet cards for our events. This is the most economical card holder around. They can pit if not store properly. Spray painting is a good option if you need color variety. We have a lot of drink orders that come through the store with limited bar space. This steel ring holder is perfect because it is small and allows us to place tickets in the holder to keep them in order! These fit perfectly with our chalkboard cards. I would like to try other ones as well. But I am glad I bought these too... I give these two thumbs up. Perfect for holding my menu cards in the case. They look very elegant and are sturdy. These are so much better than the high price ones I paid for a very flimsy holder from a local craft store. Webstaurant Store has the best products and prices. The 2 1/2" metal Ring-Type Menu / Card Holder works great to display the Halloween holiday for the little ones, "Happy Halloween." on my island. When they come up stairs and see the Halloween sign they know it is officially Halloween. You can use normal paper to make the sign. They are much nicer than we expected. They are heavy weighted and they don't easily knock over. Perfect for holding our product signage in our bakery case. Look great with the little chalk inserts that you can purchase on here. They are super easy to clean, and they look great in a bakery case. Elegant. Nice, basic menu/ card holder. It is very low to the table, and the ring comes up decently high on the card. Overall, it is exactly what I ordered, and it is a nice product. Small but good! This is great for any parties or events that you would want to have those reservation signs that can make your party well organized. These card holders are great for labeling food & look great on a appetizer station/dessert table! Great product - i would recommend this to anyone! I bought these for use at my events, to hold numbers. So far I am very happy with them, they have a decent heft so they will hold the cards better than the corks I was using before. Love these things! They are subtle, durable and easy to clean. They also don't lose the ability to hold a table marker over time with extensive use. Highly recommend these! When i saw these I had to get them. Great quality at an affordable price. I particularly like using them at my Halloween Table where I have the scariest movie characters "dine" there. I have also used them to identify baked goods/cakes at a gathering which avoids the question "what is that?" Also looks very professional on the Baker's Rack identifying items. Many uses I probably have yet to discover. The metalcraft card holder is strong and extremely durable. They add a nice touch to our products on display. We use them everyday and they continue to shine and are never dull. I would highly recommend them for any type of product info. These are fabulous and affordable! Purchased lots of them for our bakery to replace clear acrylic card holders that were showing their age. These look upscale and shiny in my cupcake case, and they work great with the little chalk cards sold here on this site. Together, it's a modern combo, and makes it simple to switch out flavor tags. This ring menu/ card holder are very elegant looking and it make the display table has a touch of class. Nice product to have to display the name of your product. These are okay. They are not heavy duty so when used outdoors with a little wind the menu and holder just topples over. Perfect for indoors. I use the stand to display price tags. The stand works as expected but doesn't grasp the tag as well as I'd like. Not bad for the price. Excellent quality for the price. I use these card holders to display the names of some of the products that we offer in our store. These work perfectly for holding the item tags in our bakery display case. We also use them to put up signs on our outdoor furniture in the summer. Perfect size for my use to label my syrup containers, its easy to wipe clean and it is very attractive and simple. Highly recommend for its style. I Needed these to hold up name tags for my cake pops at an event . The complete display was lovely once it all came together . Works as needed. Bought these with the little black chalk bards and now we can label each item offered on our buffet station. Simple and easy to use. The menu card holders are perfect for our desserts when we set up the items on our display tables for pricing and description. Customers have asked where do we buy them from! These are compact and sturdy stands to use to display product names. They are easy to wash and care for and the finish stays looking good over time. I love these little things! SO convenient, lightweight, they wash and polish beautifully (and by polish, I mean 'dry off') AND... you can totally pretend you're a belly dancer when you pick up multiples on each finger. These are great. We actually use them to display the cFlavors of our cupcakes, and they do a great job. I use them every day! We use these to label our bakery products in the dry and cold displays. I suppose you could use them for place cards but I was excited to find them for our bakery section. We have about 700 of these in our shop for labeling different goodies and other products. We've had some for over two years - never rust despite washing daily and air drying. They're the perfect size and look clean and chic. very pretty. these rings are tightly held together, but one should have no problem sliding a piece of cardstock in between the rings. I used them to display my table numbers which are made of thick cardboard and with a little maneuvering I was able to get it in between the rings no problem. Many different uses for these card holders and I will definitely get good use out of them for my wedding. We use these table top for our revolving specials and they look so elegant. The only drawback is since they really look nice, sometimes they would go missing from the table. Since these little guys are useful for so many things I would call them well worth the little bit of money spent. We use them to label food on our catering buffet lines, label drinks in unmarked containers, as well as spread the word on specials or upcoming events on our tables in our restaurant. A bargain at this price, they are heavy enough to support heavy card stock and have rings that can hold more than one item if need be. Easy to wipe down and clean up if they get spilled on as well. I call that a lot of wins for one item!! These make our Soup Kitchen tables look so classy while holding the table numbers up so that we all can see them. Just what we needed! We use these menu holders to label our pasteries in our breakfast area. They are very durable and inexpensive. Also very easy to clean and replace. I just can't get enough of these. I use the mini chalk boards with them and it looks so fancy. Highly recommend! I will be purchasing more. This card holder is very useful in my store. We use it for the order numbers as well as for the menu we have on the tables. They are easy to clean. We use these to display our daily specials on the tables. They are a nice size. Noticeable but not too bulky. They don't tip over either. Great item and great price. Simple and cost effective multiple use holders. We use them for both table number holders for event, buffet food sign holders for buffets and as a sign holder on the bar. Excellent purchase, I love the menu card holder on the food table. It looks great. It brought a classic look to the buffet serving tables. These are small enough that they are great for labeling items on a buffet in a more professional manner!! Easy to insert any display card!! So cheap! These are very handy little holders, and work great for displaying our beverage selections. They hold the menu tight but not too tight. And the price was very reasonable, too. These menu card holder are really nice and so is the price. I ordered a dozen for catering and they really look nice in front of the food. Holds your drink menu or regular menu perfectly on the table and looks great presentation wise. You want your restaurant to always look it's best right? Menu card holders are made really well and they dont rust. I use mine to place in front of food for catering. It adds a great look. The menu card holders are very pretty to display in front of foods being served when i'm catering weddings. They hold the cards great.Very good buy. These card holders are great! I like that they're simple and don't distract attention from our products. We print signs on business cards for inexpensive and quick cards! This are the best sign holder that I have found. The label does not slide down like another kind I had did. It keeps the label standing to show good visibility. The design of the bottom helps keep it from falling over. I purchased the menu/card holders to label my cupcake displays and for table seating holders. I am very pleased with this product and will be order more soon. I purchased thirty six of these to use for the table numbers I ordered as well as the Labels for the buffet. They were wonderful!!! It is surprising how something as simple as this card holder can not only save a alot of questions on the buffet, but help dinner guests navigate through a buffet with ease. A must for anyone serving buffets. These are great! Perfect size to fit in the bakery display case I also purchased here. They hold small discription cards for the different flavors of cupcakes I offer & fit perfectly in the corner of the tray. Nice product with good quality that I would purchase again. I would reccommend this product to anyone and I would purchase this item again if needed. These little holders are great! They are used to display all of our pastry name tags. They're a great size and they clean up easily. They don't dent or rust. I use these great little card holders for so many things. They look terrific on my table (holding names of my items, prices, etc) when I'm selling baked goods at markets. Very shiny, sturdy and a great value for money. Perfect! The quality is great and we love the finish. Heavy Enough to stay put on any surface. Also can work for Casual or Fancy. These little table top holders are perfect and super easy for quick change out of cards and advertising. Affordable too so if you have a lot of tables this is the item to use! These are just the right size to lable food on our buffet tables. The thin label holder does not block any of the printed labels we use. Others have obscured the printed words & people kept picking them up and then drop them... these I like! What a great product! I purchased it to hold index cards to be used on a large raffle table. They looked great and they did a great job holding the index cards. They made our raffle table look very neat. What a great price too! We're a fundraising group for a local high school and this was very affordable.